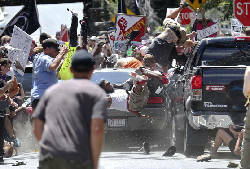 BEDMINSTER, N.J. (AP) — President Donald Trump on Saturday blamed "many sides" for the violent clashes between protesters and white supremacists in Virginia and contended that the "hatred and bigotry" broadcast across the country had taken root long before his political ascendancy. Speaking slowly from a podium set up in the golf clubhouse, Trump said that he had just spoken to Gov. Terry McAuliffe, D-Va. "We agreed that the hate and the division must stop, and must stop right now. We have to come together as Americans with love for our nation and ... true affection for each other," he said. "We condemn in the strongest possible terms this egregious display of hatred, bigotry and violence on many sides, on many sides," said Trump. "It's been going on for a long time in our country. Not Donald Trump. Not Barack Obama. It's been going on for a long, long time." After completing his statement and the bill signing, Trump then walked out of the room. He ignored reporters' shouted questions, including whether he wanted the support of white nationals who have said they backed him or if the car crash in Virginia were deemed intentional, would it be declared to be terrorism. The previous two days, Trump took more than 50 questions from a small group of reporters. A White House spokeswoman did not immediately respond to a request for an explanation as to what Trump mean by "many sides." White nationalists had assembled in Charlottesville to vent their frustration against the city's plans to take down a statue of Confederal Gen. Robert E. Lee. Counter-protesters massed in opposition. A few hours after violent encounters between the two groups, a car drove into a crowd of people peacefully protesting the rally. The driver was later taken into custody. Trump, as a candidate, frequently came under scrutiny for being slow to offer his condemnation of white supremacists. His strongest denunciation of the movement has not come voluntarily, only when asked, and he occasionally trafficked in retweets of racist social media posts during his campaign. His chief strategist, Steve Bannon, once declared that his former news site, Breitbart, was "the platform for the alt-right." Colorado Sen. Cory Gardner tweeted "Mr. President - we must call evil by its name. 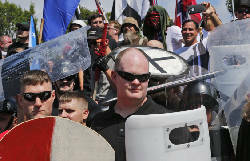 These were white supremacists and this was domestic terrorism." Florida Sen. Marco Rubio wrote "Nothing patriotic about #Nazis,the #KKK or #WhiteSupremacists It's the direct opposite of what #America seeks to be." And former Arkansas Gov. Mike Huckabee, father of Trump's press secretary Sarah Huckabee Sanders, posted "'White supremacy' crap is worst kind of racism-it's EVIL and perversion of God's truth to ever think our Creator values some above others." The president's reluctance to condemn white bigots also stood in stark contrast by his insistence of calling out "radical Islamic terrorism" by name. "Now, to solve a problem, you have to be able to state what the problem is or at least say the name," Trump said in a general election debate. 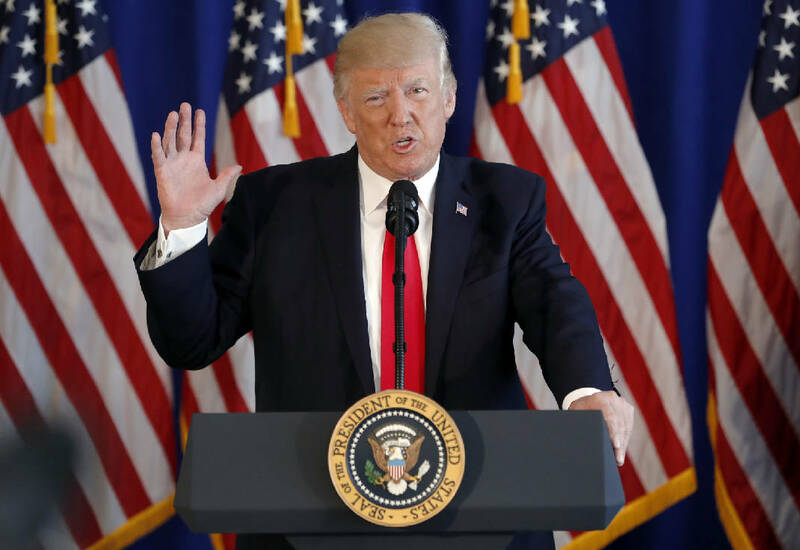 In his remarks Saturday, Trump mentioned the strong economy and "the many incredible things in our country, so when I watch Charlottesville, to me it's very, very sad."